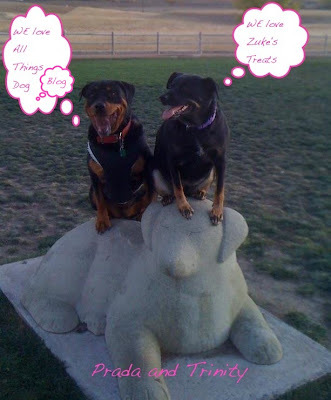 The All Things Dog Blog Treat Review Team is feeling pretty good about themselves these days. After seeing how heartily you entered the Zukes giveaway, they feel confident that their taste buds are on track. If you missed the review, check it out at this link to learn more. Purchase right now through Amazon (this link will take you to one product, but they have many available there to choose from, so shop and select the ones you'd most like to try. If you haven't already peeked at the Rafflecopter, you're probably ready for the announcement, eh? Let's get to it. As promised, 6 winners will each receive 2 boxes from an assortment of the Superfoods and MiniBakes lines. The winners are Penny Hyde, Kelly Ann T, Michelle Spayde, Jessi Greenmamajama, Linda Davison, and Danielle E. Congratulations to each of you. Full disclosure: All products in this giveaway are being provided by Zukes as a promotional courtesy. I have not been compensated for managing this giveaway. Amazon purchases via any of their links on my site benefit both Zukes and All Things Dog Blog by paying a small percentage of sales made from these links to support my site. Thanks for sharing the results and the pictures. They are so cute! I'm sure it was very hard to pick just a few winners from all the great entries showcased on your Facebook page. Will you be doing other giveaways with other sponsor companiess? 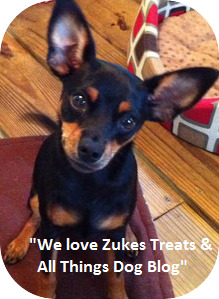 It seems like a great advertising technique, and I know we will be trying Zuke's next time we are treat shopping!